Hello friends, happy spring; quite the excitement for us North-Easterners. Now we’re finally at the most well known part of the rug making process; the weaving. With our rug design in hand (rug map), and dyed wool in hand, we are good to go! Before the actual weaving begins, the loom needs to be set up. The weavers begin by warping the loom with cotton. The warp strands are all parallel to each other and go the entire length of the loom. The warp setup dictates the knot density for the carpet; the closer the warps are together the tighter the weave will be. Weaving then begins by placing a few rows of cotton weft at the bottom end to secure the end of the carpet. After this, knots are tied to the warps row by row and packed tightly with a comb hammer. To make a 9×12 in a 10×10 hand knotted construction takes about 360 man days, or 2,880 man hours! It’s a huge investment of time and money to make a quality carpet. In the hand knotted rug industry, most of the weaving is done in cottage industries. Cottage industries are small-scale manufacturing businesses run out of homes in villages. The video below was taken on my last trip to India and shows a perfect example of this amazing industry! In it we can see a family’s home with a loom setup right outside of it. The loom is owned by a subcontractor who gets his work from the rug manufacturers in the area. When you invest in a handmade rug for your home, you are investing in the weavers, the places where these rugs come from, and a sustainable product. The subcontractor usually owns 2 to 3 looms, just enough for him or her to manage on a daily basis. As the subcontractor he is the point man for the manufacturer and is ultimately the one responsible for getting the carpet done on time and correctly. For most weavers, weaving is their main source of income, but for others it is a secondary source. Most if not all the weavers I’ve encountered in my travels love to weave. They weave with friends and family, and are very grateful whenever I’m able to give them a rug order. Their livelihood depends on in and their passion for their work is the reason why our carpets end up being so beautiful. The weavers make it seem so easy, but this was a challenge for me, but quite an awesome experience. In the previous two videos we have focused on hand knotted rug production in India. 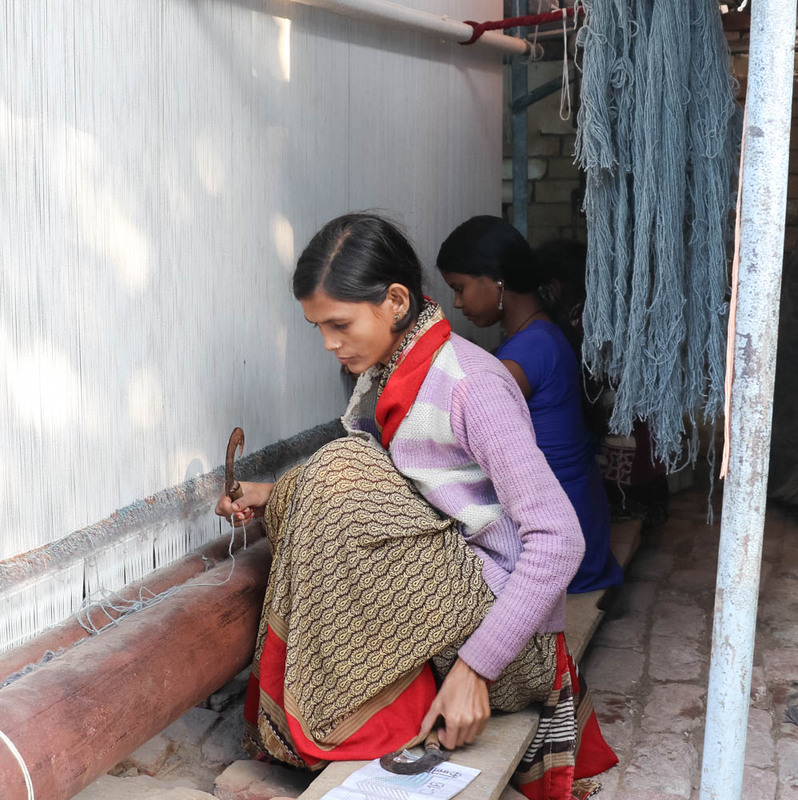 In India, weaving is mostly done on vertical looms. In Pakistan and Afghanistan, the Turkmen usually weave on horizontal looms. In Nepal, a different type of weaving is done using the loop-senneh knot. There are also many handwoven constructions (non-knotted constructions) including kilim and Soumak, and many more. Turkmen execute rugs designs on horizontal looms, the speed and dexterity is amazing. To learn more, you can read about what oriental rugs are. In this blog I show a diagram that illustrates the hand knotting technique. Until next time, happy spring and may your spring kiliming go well.